We stock and sell a wide range of Transmisson Products at our extensive warehouse on Rainford Industrial Estate,contact us directly on 01744 884888 or sales@compassbearings.co.uk to quote and order! We carry stocks of both American and British standard chains as well as a range of sprockets, both pilot bore and taper lock, to suit. The chains vary in size from 6mm to 2" pitch. We also keep on stock a range of Agricultural and conveyor chain. Chain connectors, half links and special attachments are available for all chains. Chain can be supplied in single, double or triple strand to suit your application. 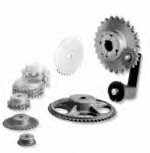 A selection of sprockets, tensioners, idler sprockets, Slat band (flat top) sprockets, Chain pullers and Chain splitters are also kept in stock. All sections of std belts are available Z,A,B,C,D SPZ,SPA,SPB,SPC, Timing belts, both metric and imperial, Link belting, flat belting and round belting. A range of pulleys are also kept in stock.